This was in October 2011, fairly late in the evening. 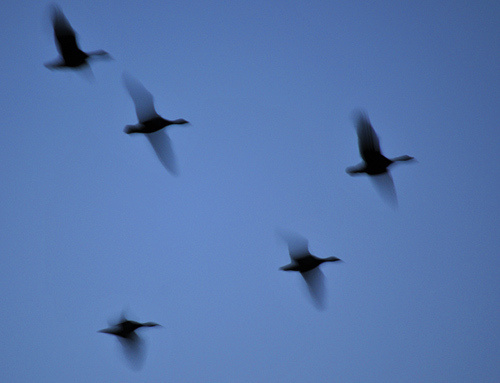 I was experimenting and taking pictures at last light when some geese flew past. I took a few pictures despite it being too dark really for photographing moving objects. One of them (slightly cropped) is this one, which despite being very blurry I somehow quite like. The silhouettes racing across the darkened sky. And on that note, good night!